Colorburst Landscape & Design LLC provides professional design, installation, and maintenance of all phases of landscaping, irrigation, lighting, pavers, walls, and outdoor fireplaces and kitchens. Colorburst Landscape & Design LLC is at the forefront of paving stone installation. We enjoy what we do, are constantly striving for excellence and warranty our work from the ground up. We believe that as people become aware of the superiority of a segmental pavement and that as we continue to require our customer's overwhelming approval of our installations, we will continue to be a dynamic leader in an expanding industry. 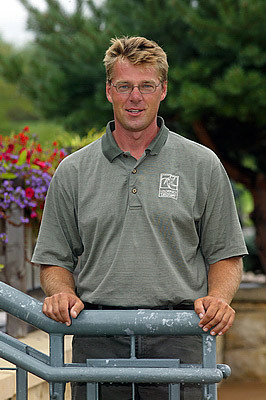 Trent Reimer is the owner and manager of Colorburst Landscape & Design LLC. Trent started Colorburst in 2004 after spending most of his life in this field. Trent received his Horticulture degree from the University of Georgia (UGA) and he has his certification from Interlocking Concrete Pavement Institute (ICPI). Trent has over 20 years of experience and is highly educated in the areas of plant material to hardscapes and everything in between. Amy Guenther is the lead designer at Colorburst Landscape & Design LLC. She is also in charge of marketing and sales. Born and raised in Nebraska, Amy graduated from the University of Nebraska-Lincoln with a Bachelor of Science degree in Horticulture-Landscape Design. Her experience with greenhouses and landscape maintenance has helped her learn about many different aspects of this industry. Amy is passionate about landscaping, and enjoys using unique plant material. She specializes in custom residential landscapes and client relationships in order to create your ultimate outdoor surroundings. Colorburst Landscape & Design LLC is a full service landscape company aimed at high quality personalized landscapes in Omaha, Nebraska and surrounding areas. We specialize in design, installation, and renovation of landscapes and hardscapes. We also offer services in fire pits/fireplaces, water features, container planters, landscape lighting, and landscape maintenance. Colorburst works one on one with clients to provide a level of customer service that other companies cannot compete with. Let us create your ultimate outdoor experience for all seasons. Contact us today for more information!